Both Scala and Java are JVM based object-oriented programming languages used for creating a wide variety of applications. Java is a general-purpose programming language which is everywhere, from desktop computers to cell phones, websites to applications, and so on. Over the years, Java has become one of the most robust and sophisticated programming languages and is still the most preferred choice among the community of developers and programmer around the world. However, moving away from a powerful and mature language such as Java does require some pretty solid reasons. Scala is a modern-day programming language that provides the best of all the worlds for developers. It bridges a lot of the divides in programming languages. The main reason for the popularity of Scala is readability. 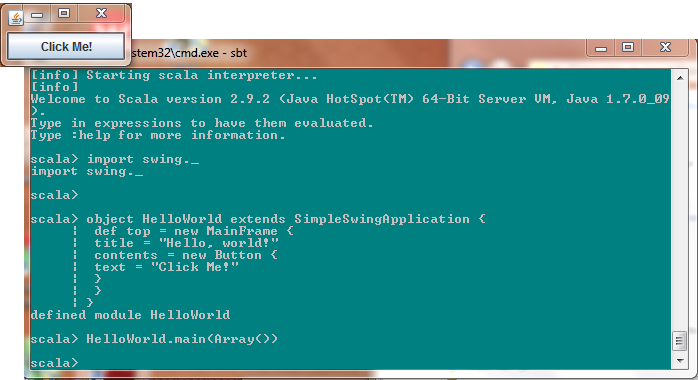 Let’s take a look at some of the apparent differences between Scala and Java. 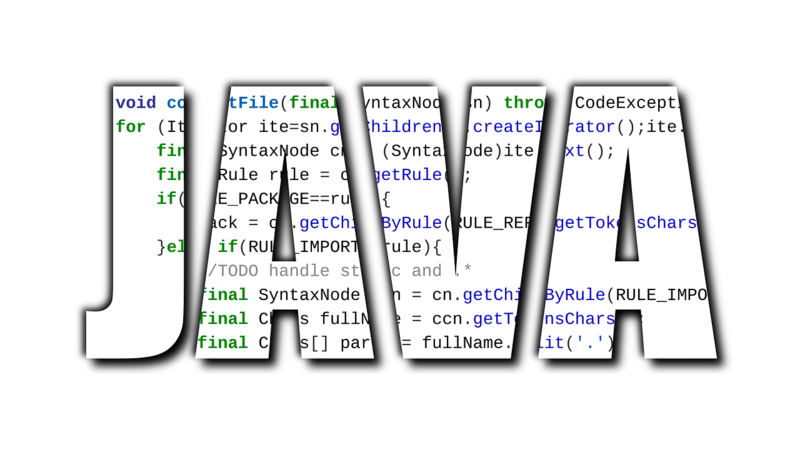 Java is the most popular and widely used programming language used by millions of developers worldwide on almost every kind of computer imaginable. Developed at Sun Microsystems, Java was designed to be a machine-independent programming language to work on different environments that is safe enough to traverse networks and powerful enough to replace native executable code. It took almost 18 months to develop the first working version. The language was initially called “Oak” but was renamed “Java” in 1995. Over time, Java has become the premier platform for web-based applications and web services. These applications use technologies such as Java web services, Java Servlet API, and many other open source and commercial Java application servers and frameworks. The evolution of Internet further helped catapult Java to the forefront of programming. Scala is a new generation JVM based object-oriented programming language that has gained significant momentum over the years as a potential alternative to Java. Although it’s not as popular as Java, at least not yet, but it’s definitely not behind either. The term Scala stands for “scalable language” and is so named because it was designed to grow with the increasing demands of its users. It provides the best of all worlds experience for developers which can be applied to a wide range of programming tasks, from writing small scripts to building large systems. The best part, it runs on the standard Java platform and interoperates seamlessly with all Java libraries. It can call any Java code, subclass any Java class and implement any Java interface. Java is a general-purpose object-oriented language developed at Sun Microsystems by James Gosling and few of his colleagues in the early 1990s. It began as a project named “Oak” in 1991 which was later renamed Java. The language borrows much of the syntax from C and C++ but with fewer low-level facilities. Scala is also a general-purpose object oriented language but is more object oriented than Java. Scala is the brainchild of a German computer scientist and professor of programming methods at EPFL, Martin Odersky. Both Scala and Java are object-oriented languages that run on JVM (Java Virtual Machine), however, Scala incorporates both object oriented and functional programming into a fairly concise and extraordinary language. Developers need to write several lines of code for routine tasks while using Java, whereas Scala considerably reduces the several lines of code into succinct and concise code making it easier to identify and rectify bugs. However, it has a more complex structure than Java. Scala is more object-oriented than Java because Scala does not have static members; instead, it has singleton objects – a class with only one instance. Everything in Scala is an instance of a class, whereas in Java, there are primitives and statics that are outside of the OO model. Moreover, all operations on entities are via method calls in Scala while operators are treated differently in Java and are not method calls. In Java, a class can have static methods and data. This way, there is a single point of access to the method and a class need not to be instantiated in order to access static methods. Static variables provide global access to the data across the JVM. Scala, on the other hand, provides a similar mechanism but in the form of objects, which are implementation of the singleton pattern. There is one instance per class loader and this way it is possible to have globally shared state. However, objects are instances of classes which allow objects to be passed as parameters. Scala runs on the standard Java platform and interoperates seamlessly with all Java libraries. It integrates seamlessly with Java meaning Scala can call any Java code, subclass any Java class, and implement any Java interface. It is totally Java compatible. However, there are features of Scala that cannot be accessed from Java, including traits with defined methods, classes and methods with illegal names in Java and Scala’s advanced types. The major difference lies in what programmers see and the advanced type checking while compiling code. Both Scala and Java are JVM based object-oriented programming languages used for creating a wide variety of applications. However, Scala is more object-oriented than Java which incorporates both object oriented and functional programming into a fairly concise and extraordinary language. Scala has all the advantages of the Java platform and it operate seamlessly with all Java libraries, except it does not support backward compatibility. Scala is fast and concise with more type-safety features than Java. However, Java has been around since ages which accounts for its popularity and maturity. Sagar Khillar. "Difference between Scala and Java." DifferenceBetween.net. 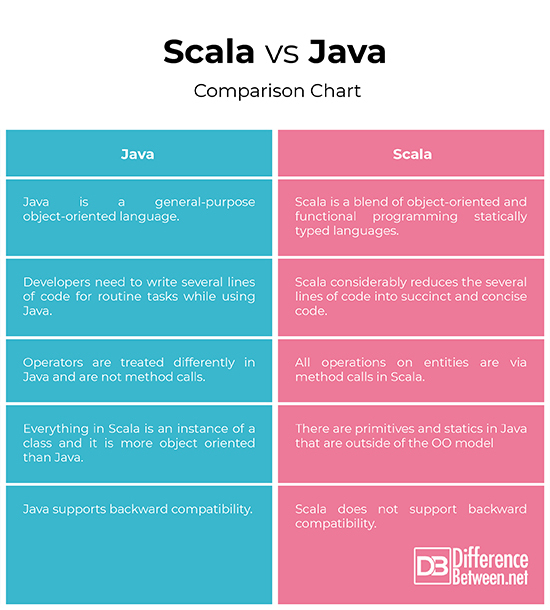 January 9, 2019 < http://www.differencebetween.net/technology/internet/difference-between-scala-and-java/ >.